At one point solid state drives were the dame of the tech press. Everyone was clamouring to cover them and gain access to the legendary boot times they promised. But those mystical boot times turned out to be something of a legend; they were certainly fast but the speed increment just wasn't that much. Blistering sequential reads and write speeds simply didn't carry through to a real-world experience with its unpredictable mix of heavy random access. Add to that some worries about long-term data retention and initial SSDs were a classic first-generation technology release. Thankfully SSD's are maturing well. While no one would argue that standard spinning disk hard drives don't rule the value-per-gigabyte roost, new 64GB SSD models are coming in at under the magic £100 barrier. Or if you fancy a more roomy drive, there's always the OCZ 128GB Onyx for under £140? It's easy to see that at some point the performance gain will outweigh the extra cost for an SSD. It's also nice to know that the reliability of flash drives in general is good, a USB flash drive was recently tested and withstood 90 million writes before failing. What's more, it could still be read after the drive had failed. The biggest performance boosts for SSDs can be seen with laptops. While 7,200rpm drives are available, many 2.5-inch laptops still suffer the ignominy of running 5,400rpm drives. These laptops would see performance increases by simply installing one of the faster 7,200rpm or 10,000rpm models that are on the market. 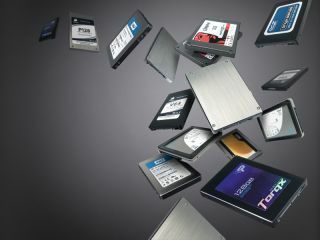 These SSDs triple the random access performance and provide a tenfold increase for sequential read/writes. In our tests comparing a 5,400rpm Hitachi Travelstar saw a maximum 30MB/s throughput, while the same laptop topped 120MB/s with a SSD. That makes an SSD the ideal laptop upgrade, perhaps even more so than memory. Of course, if you "just want storage", then you can't beat a spinning HDD on price to secure your data, our top-pick at the moment is the toughened Buffalo 1TB MiniStation. This external USB 2.0 drive comes with shock protection to avoid data damage via knocks and encryption to protect data from prying eyes. At under £80 it's a well priced bus-powered portable drive.